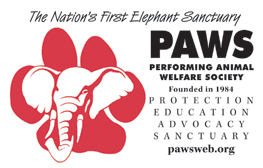 PAWS' 2017 "Elephant Grape Stomp, An Afternoon In TUSKany"
$100 per person - See ticket link at bottom of page. Above: PAWS President and Co-founder Ed Stewart presents African elephant Lulu with an edible wreath, her "prize" for winning the title Ms. TUSKany in 2013. WHO WILL WIN IN 2017? The Elephant Grape Stomp. . .
We held our first "Elephant Grape Stomp" in 2004 to celebrate the arrival of 71, Mara, Minnie, Rebecca and Annie to our new sanctuary ARK 2000. The five original elephants were moved to ARK 2000 shortly after our first barn, the current African barn, was constructed. PAWS co-founders Ed Stewart and the late Pat Derby learned about the fondness all elephants display for “everything grape” when 71 was a sickly little baby with no appetite for food. Pat was voraciously reading any book she could find on wild elephants, and remembered a particularly amusing and informative one, Congo Kitabu by Jean Pierre Hallet, which she had read in the ’70s. At that time, Pat had appeared on a few talk shows with the author and loved his hilarious story about a group of elephants in Africa who found a tree with an abundance of overripe, fermented fruit. The entire herd remained to partake of the bounty. That harvest celebration soon developed into a riotous party of drunken elephants throwing fruit as they slid around the ground, trumpeting and squealing, smashing through the orchard, delighted with the chaos they were creating. The description in the book sounded like a Bacchanalian revel. The anecdote prompted Pat to try a variety of fruits which 71 occasionally ate in small quantities, but the grapes were always devoured instantly. When local vineyards pruned their vines and donated them to the animals, they became a special favorite of the dilettante baby elephant. Pat and Ed planted the first grapevines at the Galt sanctuary that year, and they are still fruitful. After the first five elephants arrived at ARK 2000, many of PAWS' neighbors brought fruit to the elephants; the vineyards drove truckloads of grape vine clippings, and the girls ate them like candy. Ed and Pat also learned of the local Calaveras County Grape Stomp which occurs each year in October, just after harvest. Our first "Elephant Grape Stomp, An Afternoon In TUSKany" was celebrated in 2004 providing our donors an opportunity to visit the new facility. PAWS enthusiastic supporters have loyally attended the popular event which has grown in size for the past 10 years. A crowd of more than 500 guests attended the last Grape Stomp! Tickets for the 2017 Grape Stomp are priced at $100 each. This is an "adults only" event (21 and over). And no, the elephants do not actually stomp grapes! Il Fornaio will once again be catering this event. One of our all-time favorite sponsors, they have been donating to PAWS events since 1995 — Jeff Newland, one of the owners, always brings an entourage of chefs and servers who prepare and serve food to guests, also feeding volunteers and keepers who often miss lunch during the event. Local wineries have donated wine and servers each year and guests always enjoy the profusion of wines from the California Gold Country’s award-winning vineyards. Which elephant will win the title of "Ms./Mr. TUSKany" at this year's Grape Stomp? The highlight of this yearly event is always the Ms./Mr. TUSKany contest where you get to vote for your favorite elephant, with the winner being "crowned" Ms. or Mr. TUSKany. The "crown" is actually a beautiful edible bouquet made of favorite elephant foods, and first and second runners-up get a tasty bouquet as well. (The other elephants each get a special treat later that day.) Previous winners have included Lulu, Maggie and the late Wanda, with Maggie the toughest contender, winning three times. In 2014, for the first time, a bull elephant was "crowned" Mr. TUSKany. Fans of Nicholas purchased the most "votes", with one donor "spiking" the ballot box right before the final count was tallied. Needless to say, all the guys attending the Grape Stomp were elated! It all comes down to the number of votes each elephant receives. Votes cost $5 each and can be purchased at the time you buy your ticket (see below) or at the event. If you cannot attend this year's Elephant Grape Stomp, but would still like to vote, use the link at the bottom of this page. All proceeds from this FUNdraiser benefit the elephants at ARK 2000. Thank you! Shuttle service to visit the elephants, bears, leopard and tigers of ARK 2000. Silent Auction: Dozens of items including special gifts from Kim Basinger, Kevin Nealon, Lily Tomlin, jewelry designer Kimberly McDonald ($11,000 value! ), and Virgin America airlines. Select items from the estate of PAWS Co-founder, the late Pat Derby, are also included. The "crowning" of Ms./Mr. TUSKany 2017. Remember to vote for your favorite elephant. The winner will be announced at 2 p.m. on the day of the event. Each "vote" is $5. There will be a PAWS gift shop. We accept cash, checks and all major credit cards. Lots of walking - on dirt, gravel, grass and pavement. Wear comfortable shoes! If anyone in your party requires mobility assistance — upon arrival please let the ticket taker at the gate know and we will make special arrangements. No smoking allowed anywhere on PAWS' property and that includes our parking lot. We take fire prevention very seriously. If you are caught smoking you will be asked to leave. Click here to buy tickets & to vote for Ms./Mr. TUSKanyIf you cannot attend this year's event, but would still like to vote for Ms./Mr. TUSKany, click on the link below. If you prefer to charge your tickets by phone, please call our office at (209) 745-2606, M-F, 9:30 a.m. to 4 p.m. PST.